I don't understand the name, so don't ask me to explain it to you. Crave is a part of a small chain of restaurants originating from New York. The website states they use "fresh, never frozen and all natural chicken," for their Korean fried chicken. I remember the first time I tried Korean fried chicken (KFC) in 2009. It was glorious - (http://gltsoi.livejournal.com/73257.html) I waxed on and on about how delicious it was. 5 years later, I am still chasing that chicken from my first KFC encounter, as none have lived up to the memory. Leslie and I went to the BCAE's opening of their The Mood of Food photo exhibit - 50 lovely shoots, celebrating food in all its glory ( http://education.bcae.org/themoodoffood.html ). There is one shoot of grilled sardines that made me particularly hungry. Afterwards, we took a short walk to Chinatown to try Crave Mad for Chicken. Although it was 8pm on Friday night, there was no wait and we were seated immediately. The space is modern and sleek, and it was filled with mostly young Asians at tables topped with wings and scorpion bowls. The music was a tad too loud and too clubby for my (old) tastes. 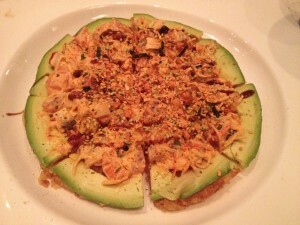 We shared the sushi pancake ($11) to start. It was pretty to look at. The crispy rice base was a little too thick, but added a nice contrast to the salmon, tuna, and octopus on top. It was topped with spicy mayo and another sweet brown sauce. I thought the fish got lost in the myriad of ingredients and Leslie thought it was too sweet. That said, we both liked it enough to finish it. On to the chicken: the menu offers wings, drumsticks, boneless or some combination thereof. They offer 5 sauces (mad - soy garlic, angry - spicy garlic, furious - extra spicy garlic, BBQ, Buffalo) and will do a half and half. We got a medium combo (10 wings + 4 drumsticks, $19) with half mad and half angry. They warn you that the chicken can take up to 30 minutes, which was about how long ours took. The chicken was good, but not transcendent like that first time. 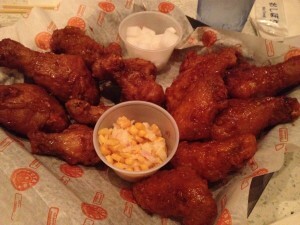 I thought the wings were obscenely small compared to the drumsticks, but the chicken was tender and the skin crispy. The mad glaze was very garlicky and too sweet. I had a bite of Leslie's angry wings and regretted it, but I'm a spice wuss. Thank goodness for the pickled daikon to temper the heat; the side of corn slaw was forgettable. The service was fine until the end and our waiter disappeared; we had to flag down another one for the bill. The prices are reasonable, so if you are in the area and are craving chicken, it is a decent option.